Creative Commons: Charly W. Karl - Flickr. The genius of Einstein is well known by many, but by only a few is it truly appreciated. Einstein’s laboratory was his mind, and his rich theories are based on a few very small, but powerful ideas. 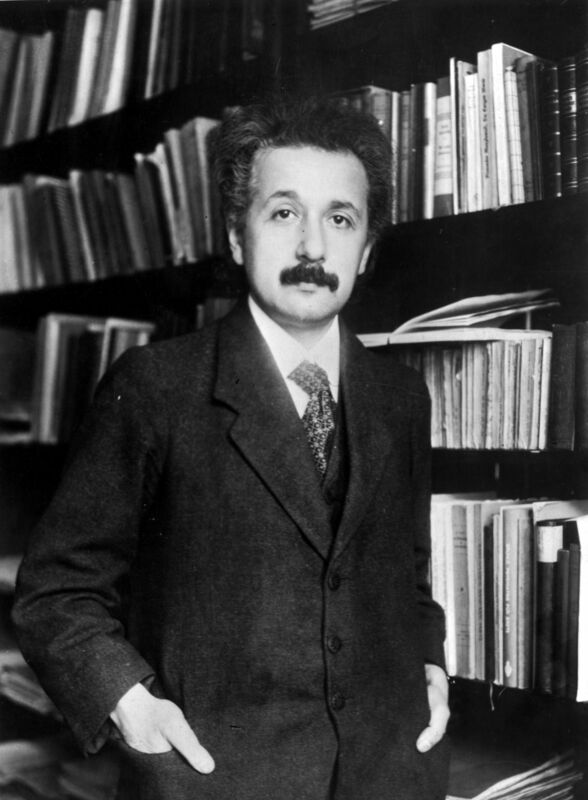 In 1916, with the help of some formidable mathematics (and a few formidable mathematicians), Einstein constructed his General Theory of Relativity (GR), which is now widely regarded as the most beautiful theory in physics. Characteristic of Einstein, the theory is based on some very simple premises, although the process of converting these ideas into mathematics, (which took Einstein himself 10 years to do) renders the theory exceedingly and infamously complex. In 1919, less than a year after the end of the First World War, a British astronomer named Arthur Eddington very eagerly sought to give experimental proof of GR. Eddington’s desire to collaborate in this manner stemmed from both his appreciation of the theory itself (his support for Einstein was considered scandalous during the time of war), and from his ideals as a pacifist, seeing benefit in uniting countries. Travelling to Africa to observe a solar eclipse, Eddington was able to show that the path of background starlight had been curved by the mass of the sun, exactly as predicted by Einstein. These results were at the time hailed as conclusive proof of GR, answering science’s demand for international collaboration, making worldwide headlines and advancing our understanding of physics. 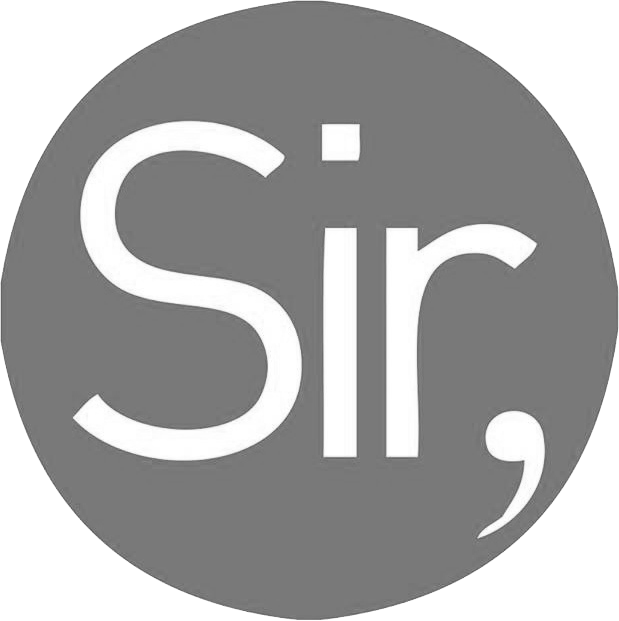 From just a few key principles and thought experiments, Einstein had created a working theory which would, over the course of the next century and at the hands of physicists and mathematicians around the world, slowly unfurl to reveal its complexities, intricacies and rich predictions for our universe. Black holes are one of the predictions which lurk in the mathematics of GR – they are regions of space where there is so much energy and matter present, that the gravity there is powerful enough to stop even light from escaping. Another phenomena hidden in Einstein’s theory is the possibility that very massive objects, moving very fast could create waves in the fabric of space itself. Einstein, along with the rest of the physics community was uncertain that these waves were either real, or ever strong enough for us to detect, though that hasn’t stopped physicists from trying. 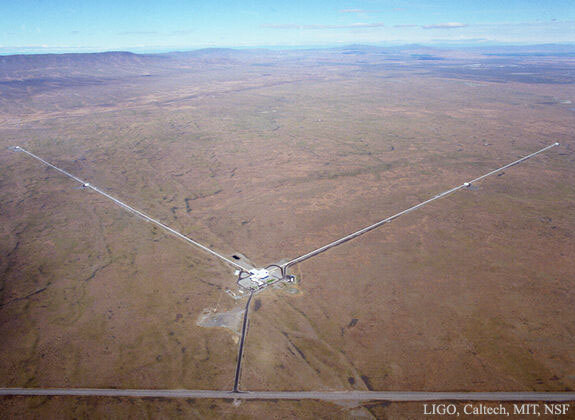 The international team at LIGO (Laser Interferometer Gravitational-Wave Observatory) look for gravitational waves by sending laser light down two tunnels at right angles to each other, and then back again. With immense precision, they then check to see if one of the arms of its L-shaped detector has temporarily been stretched in length by a gravitational wave. To give an idea of the incredible sensitivity of LIGO, the amount its 4km arm would be stretched by a gravitational wave would be less than a thousandth of the width of a nucleus. If the same factor of stretching was applied to the distance between us and our nearest star, Proxima Centauri (4.2 light years away), we could expect that distance to stretch by about half the width of a single human hair – the LIGO detectors are truly formidable. 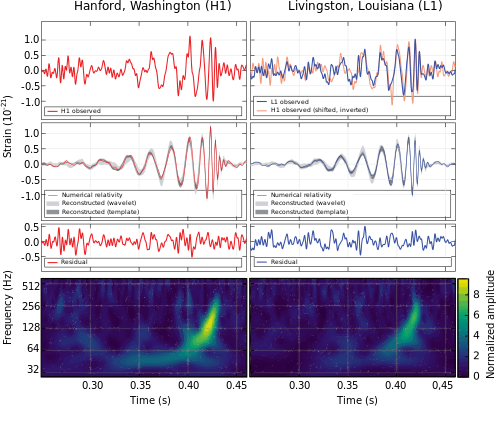 In February 2016, the LIGO collaboration stunned the scientific community, announcing they had made the first detection of gravitational waves. Now within the mathematical framework of GR, physicists are able to understand what caused the wave they detected. One of the two LIGO interferometers. Credit: NASA. 1.3 billion years ago, somewhere in deep space, two black holes, each with a mass of 25-40 times that of our own sun were calmly orbiting each other. Their fates were both entwined and certain, and their calmness just the quiet before a storm – a storm which would possess a ferocity and power rivalled only by the Big Bang itself. Both black holes were exerting a tremendous amount of gravity on each other, and so their orbits moved closer together. As this happened, they sped up, tracing out ripples in the fabric of spacetime itself. This was a runaway process, and very rapidly the two black holes fell in on each other, at their fastest moving at approximately 60% of the speed of light. This is when the gravitational waves reached their violent climax, for a brief instant being emitted with more power than all of the light, from all of the stars, in all of the galaxies combined. It was in this moment, with the surrounding spacetime rendered a tempestuous raging sea, that the two black holes merged together to form a larger black hole. Fortunately for us, as the tremendously powerful spacetime distortions fled from the scene in all directions, the laws of physics ensured that they became weaker as they spread out over a larger area of space. After the waves had travelled for 1.3 billion years, they reached planet Earth so significantly weakened that it took the $620M LIGO project and its remarkable engineering precision to detect them at all. The detection has sent out its own ripples of tremendous excitement in the physics community, but why is this discovery so significant? Although there is a large body of indirect evidence for the existence of black holes, this was the first direct evidence – a direct observation of something which, with light-based telescopes, is unobservable. It also provided the first verification that Einstein’s GR is still accurate at the ridiculously high masses and energies involved in the black hole merger that was captured. Finally, it has initiated a new era in astronomy; an era in which we can peer into the sky with a new set of eyes and look for gravitational waves as well as light. For instance, due to the nature of the very young universe, at a certain time it was entirely opaque to light, thus placing a limit on how far back in time we could use light to observe. With gravitational waves, it could be possible to see all the way back; one day humanity may create a telescope able to see creation – the Big Bang itself. Already steps are being taken towards this future of gravitational wave astronomy; a week after the announcement, the plans for building another LIGO detector in India were confirmed. There are also plans for a detector in Japan, as well as for a space-based detector. The more detectors we have, the more precisely we can determine the origin of a gravitational wave, and they cannot all be in one country. Science truly is too big to be done by just one person, or just one country any more. Now, nearly 100 years since Arthur Eddington attempted to use GR to assuage international relations, more and more countries are getting involved in the LIGO project. And they’re not competing, they’re working together. Since the time of writing a second black hole coalescence has been observed by LIGO, suggesting that the events are more common than previously thought, and that we truly are entering a new era in astronomy. 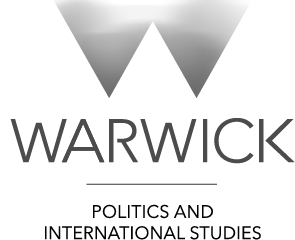 Clement Mawby is a third-year physics student at Warwick.